Week One: I’m beginning to feel slimmer and generally more fantastic. Last week Imogen Edward-Jones embarked on a six-week weight loss programme under the eye of Bodydoctor, David Marshall. She charts her progress so far. I arrive at the Bodydoctor’s in a bit of a state. Quite apart from being 38 per cent fat, surly and negative about the prospect of squat-thrusting my way through the next six weeks, I have an injury. It’s a double ankle sprain, due to a lethal combination of too many vodkas and a pair of high heels, which henceforth shall be known as the Manolo Incident. Anyway, post M.I, I can hardly move. But BD seems unperturbed and invites me to lie down on his rubber carpet. Expecting some ghastly support unitard thing to appear, I’m amazed when he simply grabs my heels with his hot hands and “humms” for a while. Five minuets later I’m on the Stairmaster climbing up 52 floors. Next the rowing machine – “Putney to the Isle of Dogs” he says, punching in 10 whole minutes. Then it’s weights for my “Eva Herzigova’s” as BD calls them. Then biceps, then triceps then… I burst into tears. Round one, day one, it’s not looking good “Do it for the children you don’t yet have,” cries BD. I very nearly thump him. But after four days of finding it hard to walk down the stairs I’m beginning to feel slimmer and generally more fantastic. I decide to brave the shops. Plumping straight for the large option, I go into the changing rooms. Walking out to do a furtive silhouette-check and I’m busted by an assistant. “That looks a bit large,” she says. “Would you like to try a medium?” I’m afraid to say I kissed her. Cheats: five glasses champagne, two vodkas, two bottles white wine (best friends birthday), some crisps (not whole packet), twiglets (ditto), weird nut toffee bought in France on holiday. David Marshall the Bodydoctor. The more I think about it the more justifiable the crime becomes. Two weeks in and, I have to admit, the novelty of walking 10 minutes uphill, cycling the Pennines and jogging to the top of Trellick Tower has slightly worn off. It’s so time-consuming. A whole two hours out of out of my day, four days a week, when frankly I’ve got television to watch and girlfriends to call. It’s hell. Actually, if I’m being honest, it’s not so much the exercise that I hate, although 250 sit-ups is not my idea of a rip-roaring 10 minutes, it’s the having to talk to someone else every day, first thing in the morning. And David loves to talk. He trots out motivational maxims as if they’ll encourage you in your direst moment of sweaty need, “water’s good” is his personal favourite, as he hands over a beaker on the rowing machine. “Breathe”, is another on the Eva Herzigova weights. “Where there’s life, there’s…” I normally mentally block the rest of that one out. “Five more because I can” is another, which in my case is normally followed by “No, I bloody can’t.” Fortunately, when things get extremely tense you can request to end the session with a bit of boxing. Aim for his jaw. The other tedious thing about this working-out business is that there is another deadly sin: combining protein and starch. I had no idea that bacon sandwiches were so evil. But it does seem to be working. 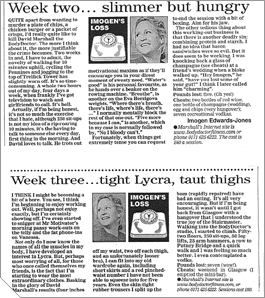 I was knocking back a glass of champagne(see cheats) at a friend’s wedding when a bloke walked up “Hey Imogen,” he said, “have you lost some of your gut?” I think I later called him “charming”. Cheats: two bottles of red wine, one bottle of champagne (wedding), egg and chips (very hungover), seven recreational vodkas.